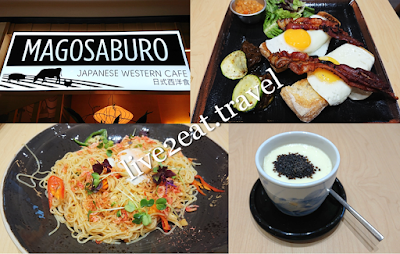 Located on the first floor of Tiong Bahru Plaza where Three Little Pigs used to be, Magosaburo is a Japanese Western Café not to be confused with the Japanese BBQ-turned-wagyu-dining restaurant of the same name (sometimes spelt as Magosaburou) on the 5th floor of Ion Orchard. Visited on a weekday for lunch and tried a few dishes. Scoop your spoon through its Salted Konbu and Truffle Chawanmushi to get a mix of ingredients in every mouth so none would be too salty. You have been warned. Sakura Ebi Angel Hair Pasta was a tad spicy but good. Break apart the runny egg yolk and mix it with the al dente angel hair pasta – also known as capellini reminiscent of our local mee kia, if you prefer to eat your food with a little sauce or dressing. And could neither rave about nor fault the Sunny Breakfast.